Extremely bitter, wart-covered fruit wrapped in toxic rinds and filled with toxic seeds hasn't kept bitter melon (Momordica charantia) out of countless home gardens. 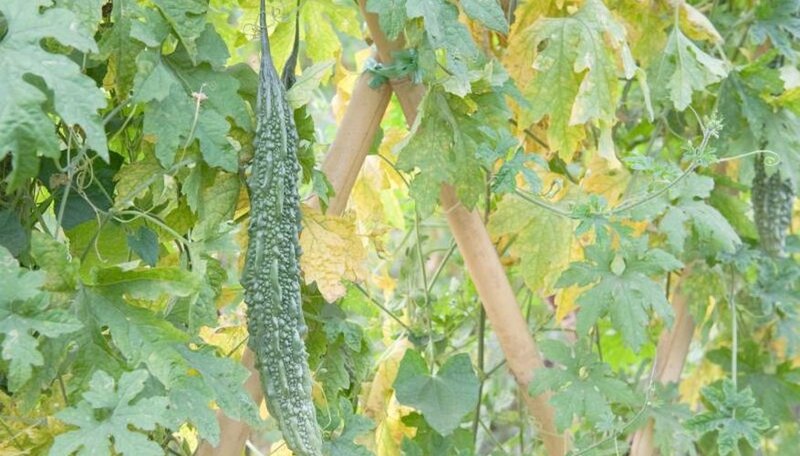 In its defense, the 6- to 10-foot vine's gourds outshine related cucumbers in vitamin C content. Its ornamental charm comes from orange, red or yellow blooms against deeply lobed, but foul-smelling, green foliage. Grow the potentially invasive plant with caution. Bitter melon grows as a perennial in U.S. Department of Agriculture plant hardiness zones 10 through 11 and as a summer-blooming annual elsewhere. While it needs at least six hours of daily sun, part shade is acceptable for seedlings in hot-summer climates if their tendrils eventually climb or spread into sun. Set the young plants 9 to 10 feet apart, preferably close to a vertical support. For a single vine, a trellis will do. Rotted gourds often accompany plants allowed to sprawl on the ground. Bitter melon needs organically rich, well-draining soil with an acidic pH between 5.5 and 6.7. Address its needs with well-aged manure before planting. Loosen the top 6 to 8 inches of soil and spread a 1-inch layer of the composted manure over it. Additionally, sprinkle 1 pound, or the manufacturer's recommended amount, of slow-release 14-14-4 fertilizer evenly over each 50 square feet of soil and work in the amendments. Fertilize again at the midway point of your growing season. Infrequent, deep watering keeps your soil consistently moist and your bitter melons happy. The goal is to provide 1 inch of water, including rainfall, per week. In a dry week, this means one watering to provide 6 gallons of water for each 9 square feet of soil. If your soil is sandy, provide half that amount twice a week. Following very wet spells, wait until the soil's top 2 to 4 inches are dry before watering again. Protect ground-grown bitter melon gourds from soil moisture with a layer of straw or hay mulch. When a vine reaches the top of its support, remove its lower three sets of horizontal branches and the growing tips of the rest. You'll get more fruit. Pruning shears rescue vines from light cases of powdery or downy mildew. Disinfect shears before and after pruning. Remove the affected foliage and dispose of it in sealed plastic bags. By increasing the sun reaching the vine's interior, pruning also discourages future fungal outbreaks. Cucumber beetles infect bitter melons with bacterial wilt disease. Discard infected plants identifiable from their splotchy, browning and wilted leaves. To save your healthy plants, hand pick the striped or spotted ladybug look-alikes from healthy plants early in the morning and drown them in soapy water. Follow up at dusk by snipping off faded flowers; they often conceal groups of the beetles. Once again, drown the pests. To keep fruit flies away, wrap ripening melons in newspaper tubes tied at the ends with string. Bitter melons with undersized, blistered foliage and green-and-yellow, mosaic-patterned gourds have watermelon mosaic virus. They won't recover and may spread the disease through insect vectors. Remove and discard them in sealed bags.